many modern mainboards have an irda connector onboard, but the required transceiver is often missing. if you can't find the exactly fitting module for your mainboard, you can probably use a module from another mainboard if you connect it in the right way. just see the mainboard documentations (or search the web) and compare the pinouts. irda modules normally need 4 signals: gnd, +5v, rxd and txd. or you can build your own irda module! download the datasheet for the tfds4500 which contains the appropriate schematic and more detailed information. on the left you see the schematic of the irda interface and on the right there is the pinout of the tfds4500 (top view). jumper jp1 is used to choose the sensitivity of the ir receiver. high sensitivity gives a greater receiving range but also more noise which could result in lower transmission speed. as you see, all boards use the same pin order! so if your board is not listed here, it could be the same. but before you plug the module into your board you should check this with a voltmeter (or better your manual). 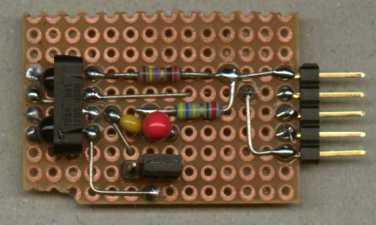 if you found out the pinout from your board and it is not in the same order than the one listes, please e-mail it to me, so i can inlude it here. i want to thank all the people, who sent me the pinout of their mainboard´s irda connector! please notice that the tfds is a smd part, but with a little bit patience you can even solder it onto a prototype board, as you can see below. 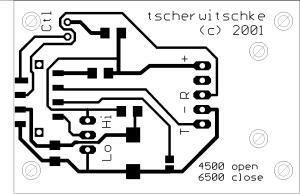 but i also made a small single sided pcb layout. download (eagle 4.0 format and 300 dpi tiff included). after connecting the module to your mainboard, you have to load irda drivers. i just took the standard irda driver found on the windows 98 cd which works perfectly for me. if you have further questions or you successfully connected a self built irda module to your board please let me know. IrDA interface for your mainboard electronic circuit. PC related electronic circuits and schematics.